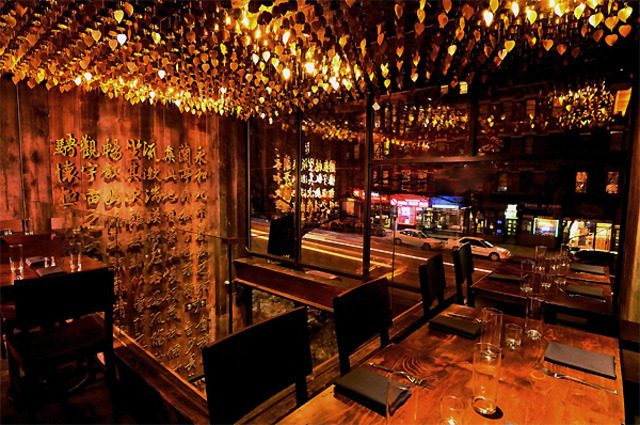 I normally don’t write about Asian cuisine but this place impressed me enough that I went two times in one week, which is unheard of for me because I always prefer trying new restaurants vs. going back to restaurants I’ve already been to… OBAO Noodles & BBQ is a chic & trendy Vietnamese/Thai Fusion restaurant with several locations in NYC. The first time I went, my friend and I were seated upstairs underneath a ceiling of pretty sparkly gold material, making a very pretty atmosphere. 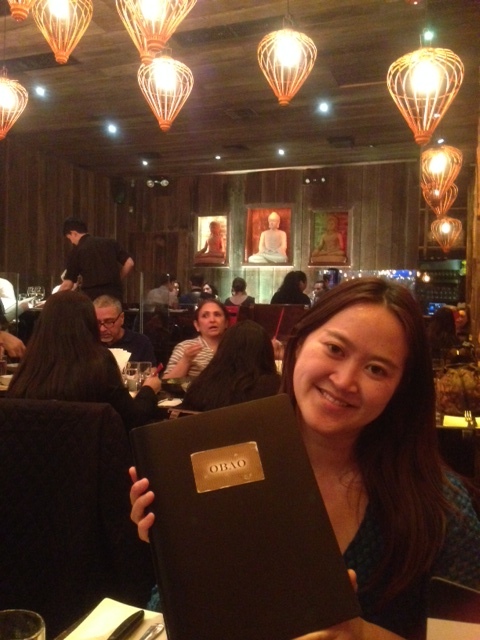 I ordered the Sambai Spiced Calamari, which had an Asian twist, and was the best I’ve had ever! 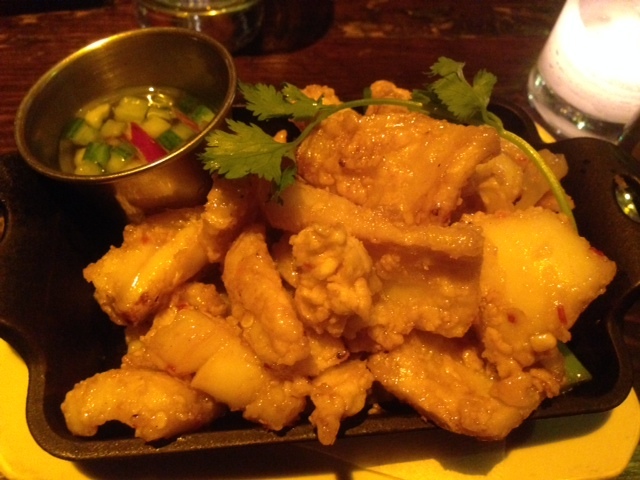 The calamari is mixed with scallion, onion, and served with cucumber relish sauce (sweet, and slightly sour). The calamari deep fried in butter spiced sauce, served warm and extremely crispy, savory and delightful, while still being tender on the inside. So good that I would go back and have it again… Not something I usually do. The service the first evening was quite slow, but I went back with another friend, we were seated downstairs and service was excellent. 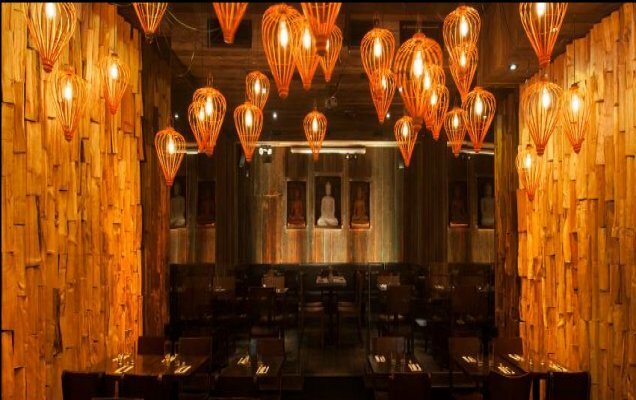 The interior had cool orange-y lights, wooden walls and a trio of Buddha statues. 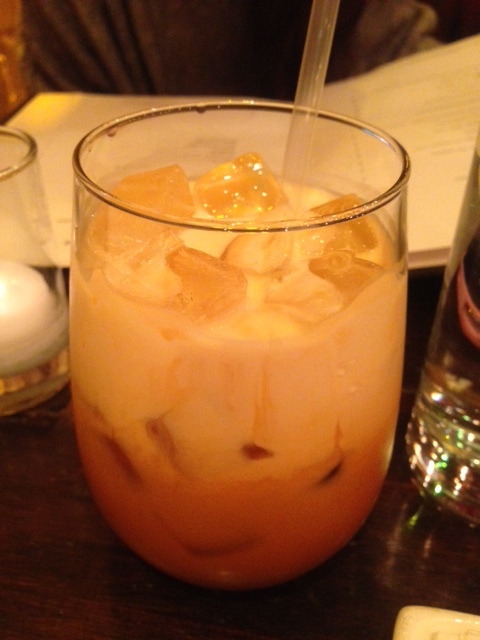 This time, I tried the Thai Ice Tea which was deliciously sweet, cold and refreshing. My friend and I shared the appetizer of fresh shrimp rolls, which consisted of poached shrimp, vermicelli, bean sprouts, mint, and hoisin peanut dipping sauce. The shrimp rolls came upon a nice display on a long wooden plate and was pretty good. I would’ve liked a bit more flavor and definitely more sauce! 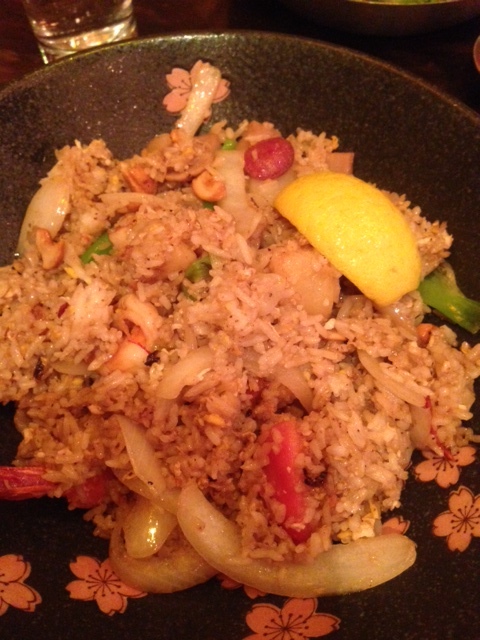 My main course was the Southeast Asian Fried Rice, which had a ton of ingredients (always a good thing for me): Shrimp, thai chorizo, thai pork sausage, cashew nut, pineapple, tomatoes, onion, scallion. Everything came together beautifully and I enjoyed the dish, though could not taste the thai chorizo. Overall, though, it was quite tasty and all the flavors and ingredients were fresh and delicious. My friend ordered the crispy duck with broad noodles and that was wonderful. Incredible savory flavors mingling together! The portions were very generous; we both had to take home at least half the meal. Next time, I would like to try the crispy Vietnamese Spring Rolls with pork, shrimp, taro & mushroom, as well as the crispy (whole) sea bass.